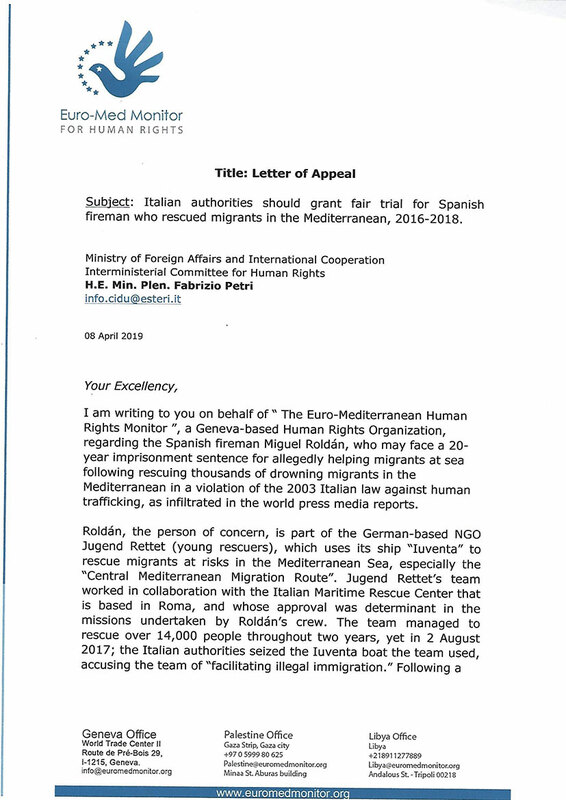 The Euro-Mediterranean Human Rights Monitor is concerned by the reports suggesting that Spanish fireman Miguel Roldán will be handed a 20-year imprisonment sentence for helping migrants at sea, after he and his team helped thousands of migrants from drowning in the Mediterranean. Roldán is part of the German-based NGO Jugend Rettet (young rescuers), which uses its ship “Iuventa” to rescue migrants at risks in the Mediterranean Sea, especially the central Mediterranean migration route. A similar incident took place in Greece in 2018, when three Spanish firefighters faced a 10-year sentence for human trafficking, but were later all acquitted. This raises concerns regarding the length of the sentence Roldán is facing. The 2003 Italian law against human trafficking, called “Measures Against Trafficking in Persons” prohibits all forms of trafficking and prescribes penalties of 8 to 20 years imprisonment. Roldán faces the highest sentence although evidence shows that the crew did not get any payment and only acted when receiving a distress call, which is an obligation under customary international law and several conventions, such as the Montego Bay convention. It must be noted that in 2017 Italy drew up a “Code of Conduct” for humanitarian rescue ships – which has been signed by only 3 organisations working in the Central Mediterranean Sea. Under this Code, Italian armed military or police personnel must refrain ships from transferring refugees to other ships. This Code could limit their operations and has been denounced by NGOs such as Amnesty International, Human Rights Watch and Medecins sans Frontieres. 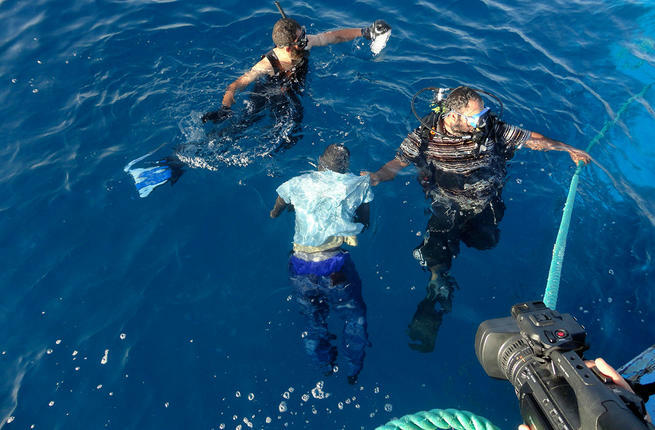 We need to keep in mind the circumstances in which rescue ships Iuventa worked under, and the importance of the work they do to save lives, which cannot be limited by restrictive laws, as restrictions provided by law must be proportionate and consistent with other rights and all international obligations. The Jugend Rettet NGO refused to sign this Code, and a few days later their ship was seized, which raises concerns regarding the fairness of this procedure. 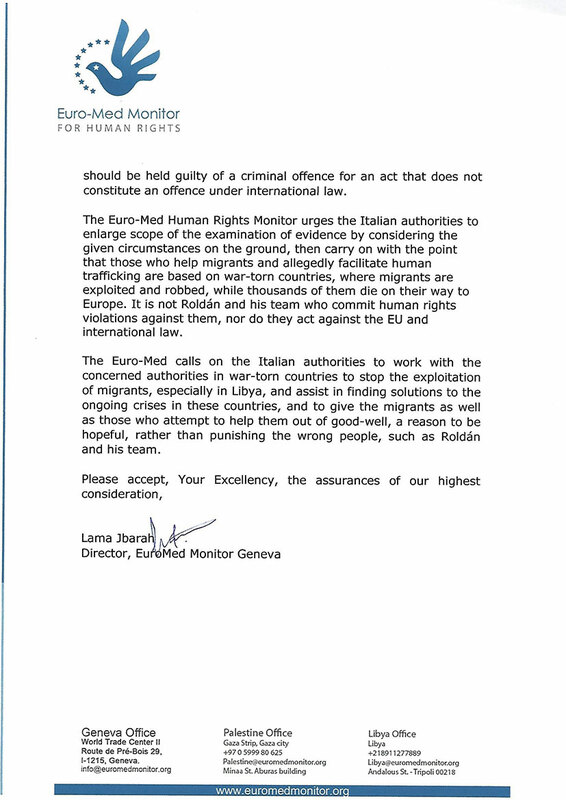 Euro-Med Monitor calls on the Italian authorities to allow Roldán to have a fair trial, acknowledging that Roldán and his team have been helping migrants out of goodwill and they managed to save thousands of them in their difficult times when traffickers abandoned them at sea. Euro-Med Monitor would like to stress the right to life, as a non-derogable protected under numerous conventions ratified by Italy, including the European Convention on Human Rights and the customary norms enshrined in the Universal Declaration of Human Rights, which has a double meaning, sometimes forgotten: it prohibits unlawful killings but also draws an obligation to protect people whose lives are endangered. 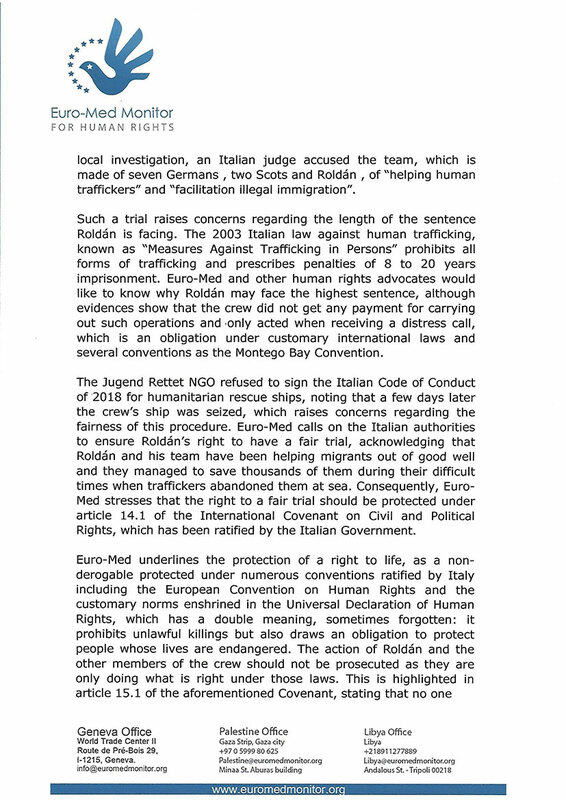 The actions of Roldán and the other members of the crew should not be deemed illegal, prosecuting them only for doing what is right under those laws. The Italian authorities must enlarge their scope of the examination of evidence by considering the given circumstances on the ground, said Euro-Med Monitor in an urgent appeal addressing Fabrizio Petri, President of Italy’s Inter-Ministerial Committee for Human Rights, Ministry of Foreign Affairs and International Cooperation of Italy. The letter stated that the Italian authorities need to take into consideration that those who help migrants and allegedly facilitate human trafficking are working in war-torn countries, where migrants are exploited and robbed, while thousands of them die on their way to Europe. It is not Roldán and his team who commit human rights violations against them, nor do they against the EU and international law. Concluding the letter, the Euro-Mediterranean Human Rights Monitor urged the Italian authorities to work with the concerned authorities in war-torn countries to stop the exploitation of migrants, especially in Libya, to help find solutions to the ongoing crises in these countries, and to give these migrants as well as those who attempt to help them out of goodwill, a reason to be hopeful, rather than punishing the wrong people, such as Roldán and his team.